In the photo showing two beaver lodges in the main pond, the one on the left is the parents' lodge. The one to the far right, partially obscured by plants, was recently built by two-year-old kits. There is a food 'raft' (better seen in the other photo) in between the homes. 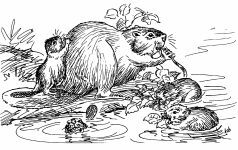 It is not unusual for beaver families to stay together with older kits helping to care for younger ones and learning the 'tools of the trade' from their parents. 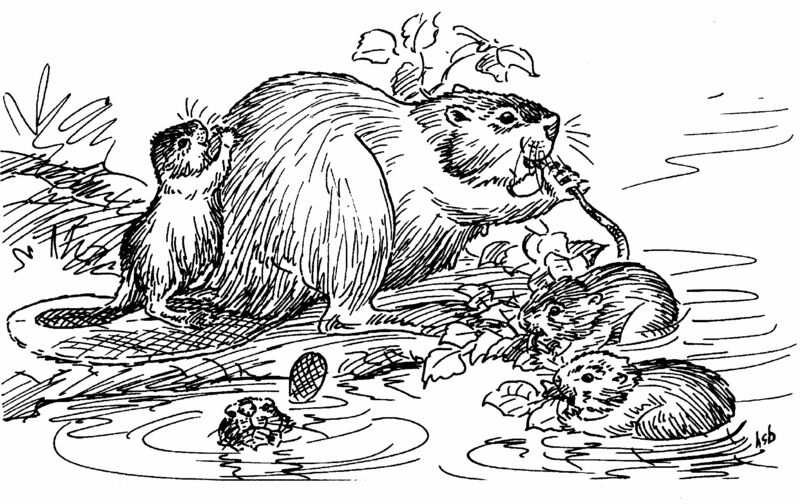 The kits' lodge, smaller than the parents', was good practice for the young beavers. The youngsters may have chosen this location because of the nearby food 'raft' which had been prepared for winter and now was being shared by the entire family. 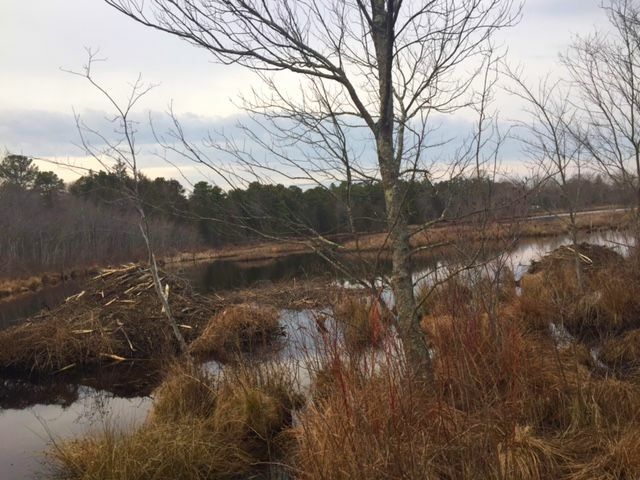 Recently, members of the Wenonah, New Jersey, Environmental Commission visited the Refuge to take a tour and solicit advice on how to humanely handle potential beaver-human conflicts in a public park in their township. Some of the concerns they had were about possible flooding on a water-adjacent path and cutting down of trees. While taking them on a walking tour, past beaver lodges and two very small dams, I discussed the installation of pond levellers to prevent flooding and how to protect trees that they wish to save. Thank you to Wenonah for being proactive and seeking humane alternatives! Back in December, we received and shared on our social media an urgent plea to contact the mayor of Mansfield Township, New Jersey. The Township had planned to set lethal traps to kill a family of beavers on a pond adjacent a Township road. 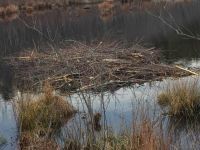 People were concerned that some older trees would be cut down by the beavers for building materials and food. We quickly sent an E-mail appeal to the mayor, Sean Gable at the time, urging him to forgo the traps and consider allowing us and local volunteers to help with an affordable, effective and humane solution. 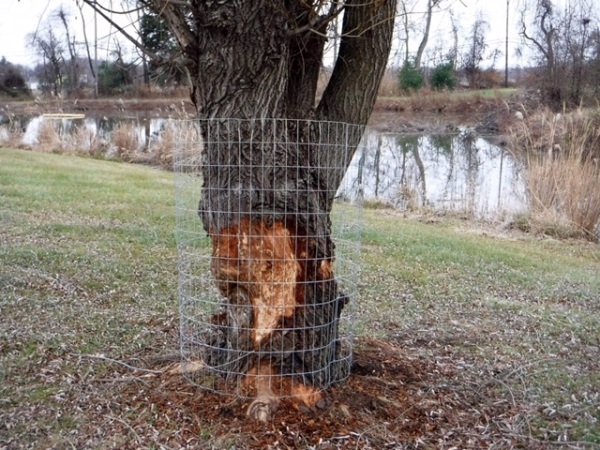 Within hours, Mayor Gable and the Township Administrator, Mike Fitzpatrick, learning of the cruelty of the traps, agreed to cancel the plans to trap and allowed volunteers to wrap trees with wire fencing. 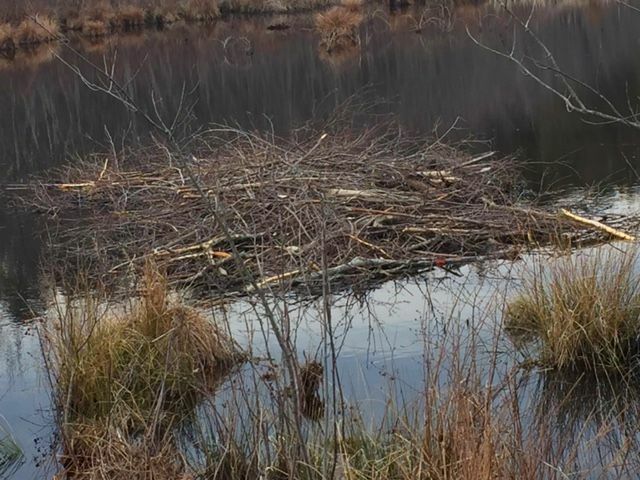 This photo, provided by local beaver enthusiast Chuck Garrett, shows a tree on which the beavers had begun 'work', but now was protected by wire. Mayor Gable and Administrator Fitzgerald are to be commended for their compassion! 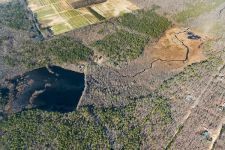 Cliff Compton, a frequent guest and aerial photographer, shared with us some new aerial photos of the Refuge. We are grateful to Cliff for these (and many others) wonderful images that provide us  and you  a unique opportunity to see the diversity of habitat that is so important for indigenous wildlife. This photo shows the main pond and surrounding land. You can see the continuation of the creek that feeds the pond, as it makes its exit down to other rich wetlands of the Refuge. 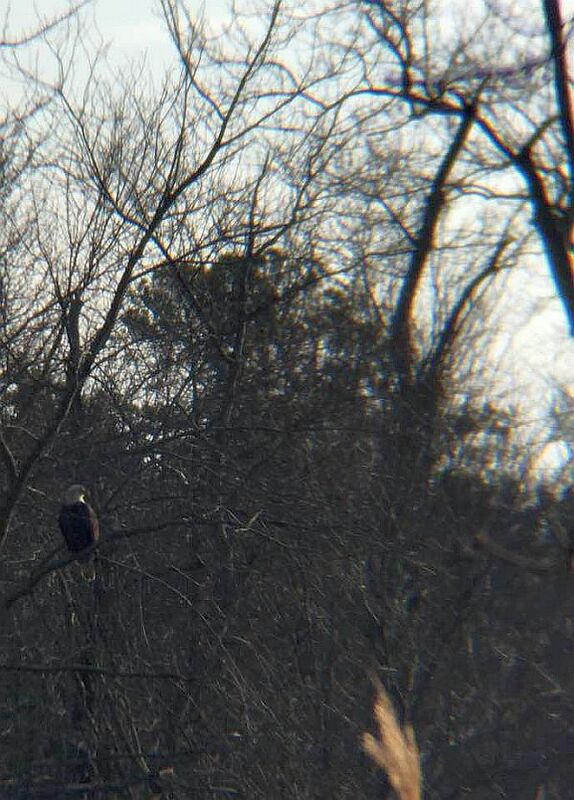 There are only an estimated 250 mated bald eagle pairs in New Jersey. We were delighted, therefore, when such a pair showed up at the Refuge with their young offspring this year. Here, one of the adults perches in a tree and watches a small opening in the ice on the main pond (not visible in photo). 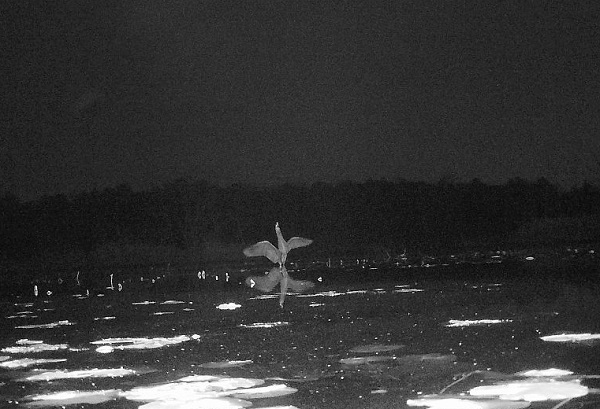 With the recent gift of a pair of neoprene chest waders, I was able to easily wade out and place a trail camera in foliage protruding out of the main pond. 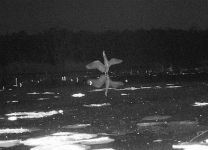 One evening, it took this ethereal, infrared photo of a great blue heron landing on the water. The main pond was the scene of constant migratory activity this year. We were happy to see hooded mergansers, ring-necked ducks, lesser scaups and a great cormorant. 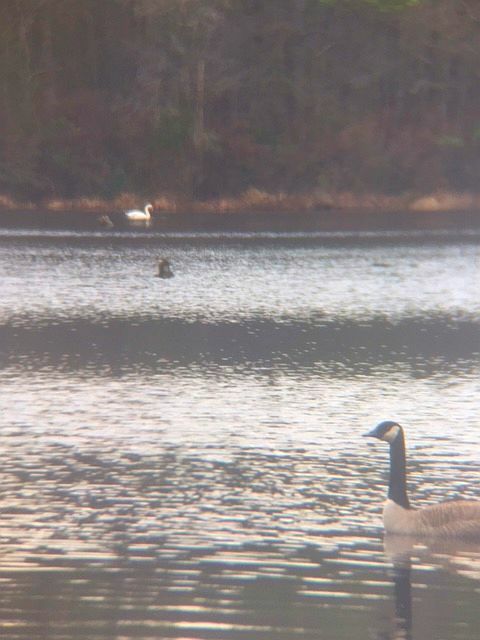 This photo shows a visiting Canada goose (foreground) and mute swan resting in the water. 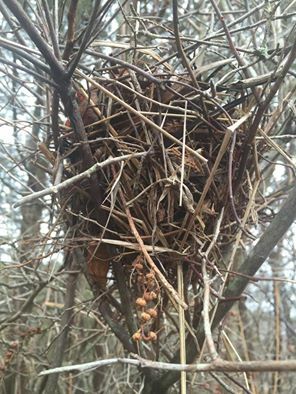 As the lush foliage began to disappear at the Refuge during the fall, we were delighted to see this beautiful, painstakingly-crafted Northern cardinal nest in the crook of a tree near the main pond. We probably walked by this nest many dozens of times during the summer and did not even know it was there. Great survival technique on the part of the parents. This February 27, at 7 PM, I will be presenting a talk and slideshow about the history of Unexpected and the wildlife who call the Refuge home. This is part of the Vegetarian Society of South Jersey's lecture series and will take place at the Woodbury Public Library in Woodbury, New Jersey. It is not too early to start making plans to join us in our annual celebration of Earth Day, April 22 at 11 AM. 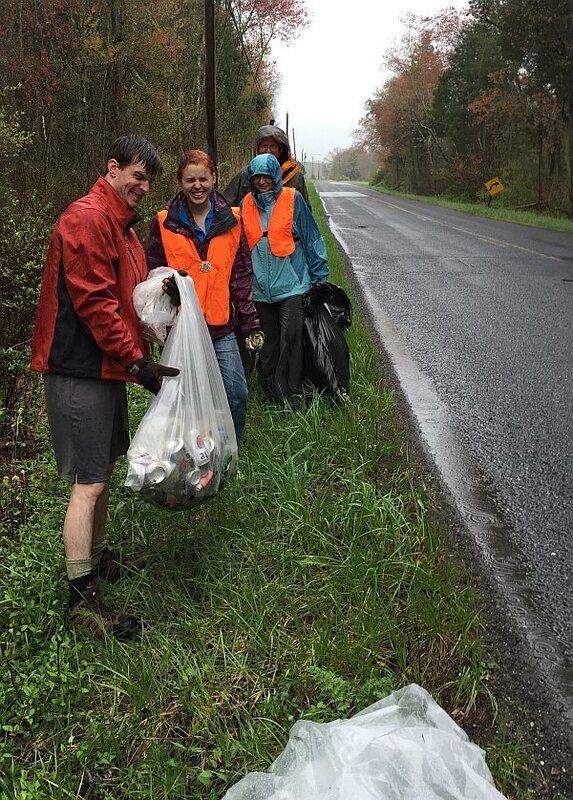 This year's Clean Up event will again be geared towards removing trash along a portion of our land bordering a two-lane road. After the Clean Up, you can come back to the Refuge for a vegan barbecue by the pond! Although a sunny day would be great, we plan to continue regardless of the weather. Please RSVP to me at director@unexpectedwildliferefuge.org or call 856.697.3541. We will make another announcement in the April newsletter. This Refuge and its nearly 800 acres of rigorously protected habitat, is home and sanctuary for hundreds of animal and plant species; many of the animal species have been here for generations. We depend entirely on the support of our donors for our day-to-day expenses! The Refuge  and the wildlife living here  could not exist without you. We know that you have limited resources and need to consider which of numerous worthwhile causes to support. We hope, however, that you can again find it possible to give us a donation  today  of any amount. We need your support right now. Our small operating costs continue to exceed our donations.